Snow covered hills... not found in my neck of the woods... but the serene feel of a setting such as this is one of the wonders of Winter. Capturing this and the glitter of snow.. at just the right angle... is a fun way to celebrate a Merry Christmas. Paired together with the aide of a favorite tool of mine, the Color Coach (#130118), the Pool Party and Island Indigo are a monochromatic match! Stamping this serene scene from the Warmth and Wonder Hostess set with the Island Indigo ink on the Pool Party card stock for a cool feel. Emboss the top with the Delicate Details and Big Shot for a snow filled sky. Add dashes of luxury with these 'snow puffs' of adhesive backed Pearl basic jewels. 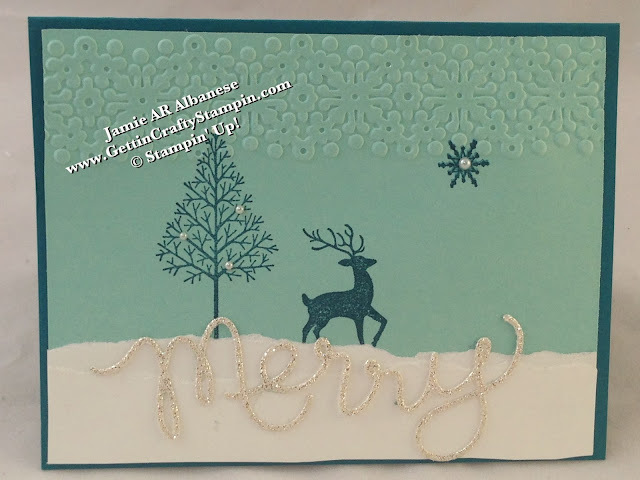 Ripping this Whisper White card stock and layering, I can create a snow covered scene. 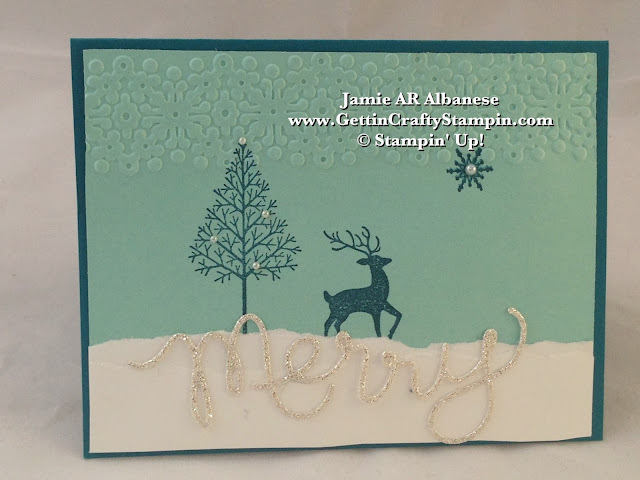 Adding this Merry from the Expressions Thinlits in Silver Glimmer Paper for a dash of sparkle to the setting. Apply with the Multi Purpose glue (#110755) and allow to dry. This scene pulls together for a WOW of grace and beauty. I remember going to our prom and there was a deer that came to the window of where we were eating. It's a majestic animal.. and this scene is one to take my breath away.. I'm glad you came by today! I try to post daily and hope to see you often! Please come and bring others with you!! May the wonder of Winter and the Holiday Season give you a moment of awe. You may see deer or not in your neck of the woods... but the beauty of nature and the season can inspire a wow moment or two. 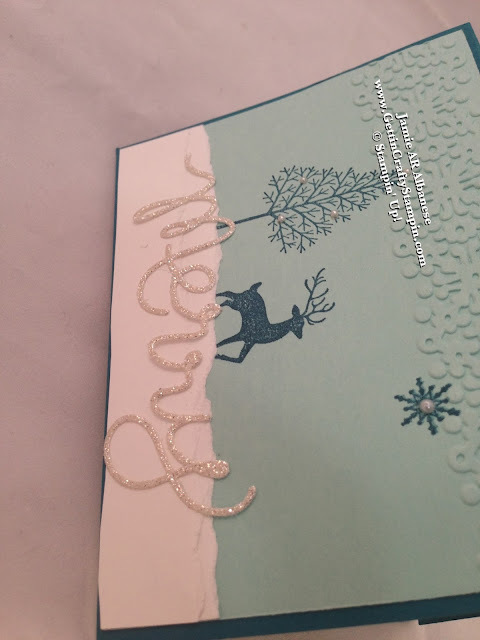 Enjoy card making (and Join Me) and create with a dash of sparkle and luxury.